GULF OF ADEN (April 17, 2011) USS Mason is assigned to Combined Maritime Forces Coalition Task Force 151, supporting counter-piracy and maritime security operations in the U.S. 5th Fleet area of responsibility. CMF engages and builds capacity with regional and other partners to improve relevant capabilities in order to protect global maritime commerce and secure freedom of navigation. 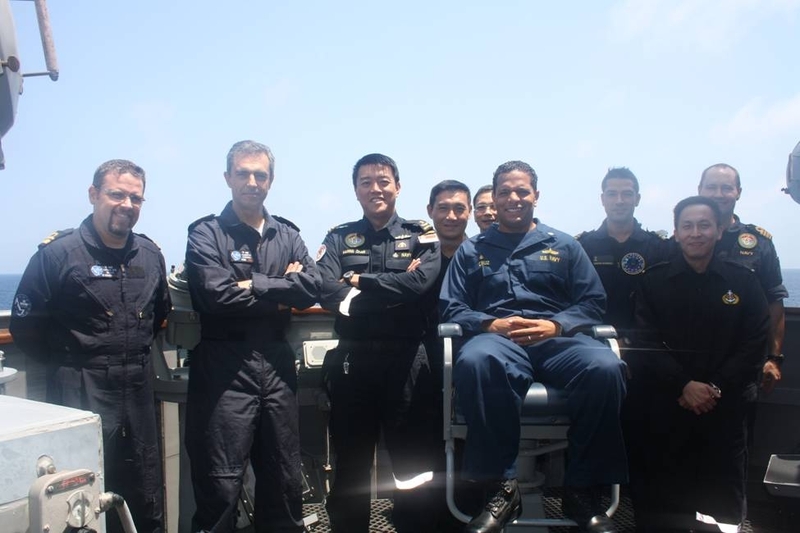 Onboard USS Mason, from left to right: LtCdr Artur Lucas da Silva; Cdre Alberto Correia; Radm Harris Chan; SLTC Thng Chee Meng; LTC Cheong Kit Chong; Cdr Adan Cruz; LtCdr Miguel Calhau Algarvio; Maj Dewayne Wan; Cdr David Mcewan.